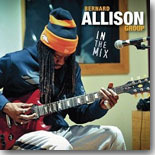 Bernard Allison may cover some of his late father's tunes on his new CD, In The Mix, but he proves that he's truly his own man and one of the top artists on the blues scene today. His new one is this month's Pick Hit. Two of our reviewers agree that the new one from Chris Daniels & the Kings, Funky to the Bone, is a worthy choice as this month's Surprise pick. We do something a little different with this month;s Flashback feature, featuring a release, Last Man Standing, by 88-year-old Delta guitarist Cedell Davis that includes both a new CD and a re-release of a previous album. Our What's New section features reviews of new CDs from Steve Earle & the Dukes, Jewel Brown, Bobby Messano, Jon Spear Band, Igor Prado Band, D.A. Foster, Eliza Neals, Big Dave McLean, Toots Lorraine, John Earl Walker, Tas Cru, Eef & the Blues Express, Jeff Jensen, and more.